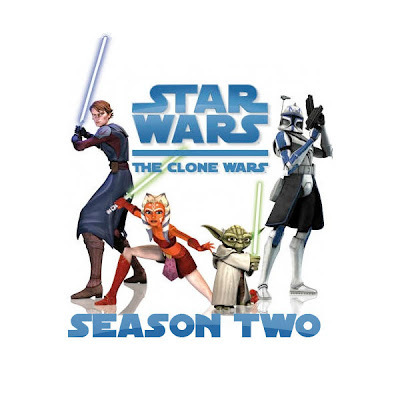 I've not mentioned much about the second season of "Star Wars: The Clone Wars" on Cartoon Network in a while. Even though they're closing in on the end of this season, I haven't really talked much about it. I've only watched a few episodes. They're were quite good, especially the ones written by Paul Dini, but a couple of them just fell flat. Overall, the quality has been better than I'd expected, but I still prefer Genndy Tartakovsky's 2003 version. I can't believe that Lucas is almost ready to start a third season. Think about it, that'll happen in October. Lucas' original plan was to go for 100 episodes, but that is a very difficult thing to pull off in/on television. That many episodes would take around five seasons and most shows are lucky to last three or four. Ratings are brutal. Luckily, the ratings have been very good. By then end of this season there will be 44 episodes and it's all but given that CN will green light a third season with the ratings they're giving the cable network. That'll put the show at 66 episodes and well on it's way toward the hundred episode number. If he keeps this up George is going to have enough content to start his own channel. I don't know if it would be the Star Wars channel or a broader Lucas Channel, but that Empire keeps growing and growing. Now, back to my point. The end is near for CW's S2 and Lucasfilm has released the trailer for The Clone Wars - Season Two's finale entitled: ". "Lethal Trackdown" Take a look at it and see what you think. It has compelling elements, but I liked the conclusion of last year's season finale "The Ryloth Trilogy,"better. Boycott Cartoon Network! They are a bunch of greedy corporate fascists who and advocate pro-censorship by removing Plinkett's Attack of the Clones review unjustly citing copyright infringement when he was merely expressing his first amendment rights and public domain fair use! Are you feeling alright Honor? There are a lot of big typos and grammatical errors in this post. You might want to go back and proof read this post. Thanks for asking. But I wrote everything there as it was meant to be said. It was said as a "Stream of Consciousness" post. It's not a college dissertation or novel. It's my thoughts, my way. Exactly as I would say it to a friend. You don't put an apostrophe after someone's name if it ends with an "s," just so you know anonymous. Thank for noticing some of those Anonymous, I read it several times but missed a couple. As Ananamous said, I've never used an apostrophe after someone's name with an "S." Was always taught it was a redundancy factor. Almost like a stutter to put another "S."
I enjoy the series, but I rarely catch it as it's never on when I'm watching TV.